Supports digestive health and a balanced intestinal environment. Anyone seeking to heal their gut of overcome a digestive issue should seriously look at colostrum. The immune factors and antibodies in colostrum can be extremely healing to the gut. Great for the immune system. Research has even proven that using colostrum can be more effective at preventing the flu than a vaccination. Good for the cardiovascular system. Can offer relief to people dealing with autoimmune disorders by restoring the function of the thymus, a gland that is important in regulating how the immune system works. Adaptogenic – helps the body deal with stress. For the full download on this superior superfood, click here to read my comprehensive article. Colostrum has a rich, creamy, slightly sweet flavor that I find delicious. It’s perfect in elixirs and smoothies lending a nice creamy consistency. 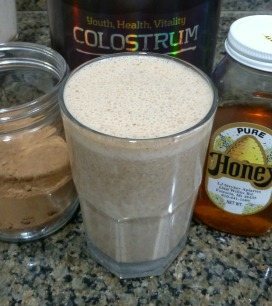 In my opinion colostrum takes elixirs to a whole new level of nutrition and yumminess. If you’re wondering, I used Pau d’arco tea when I made this elixir. Enjoy! I’d love to know if you try this chocolate colostrum elixir – please leave a comment below. Happy Blending! Coffee in moderation has been shown to impart some nice health benefits. 1 cup a day would qualify as in moderation. I haven’t come across research that coffee wreaks havoc on the kidney and liver. If you want to kick the coffee habit, herbal tea would be my recommendation. Maybe you can make your weekend drink during the week.